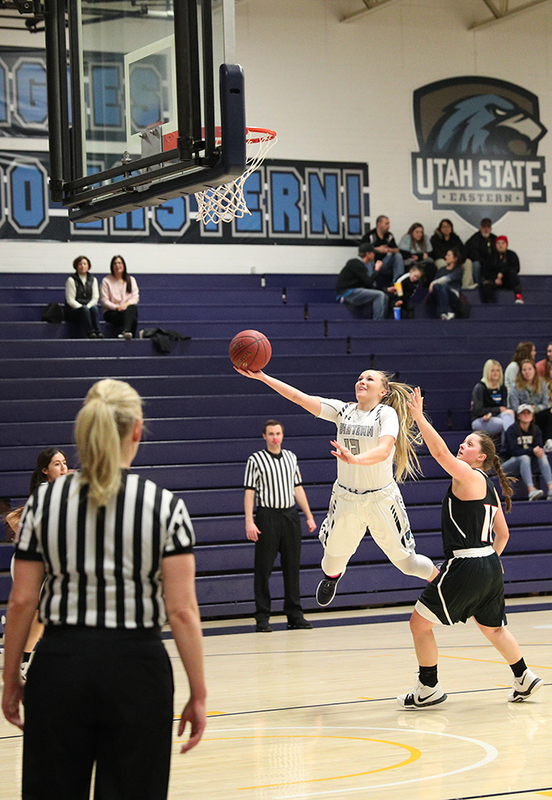 Utah State Eastern women›s basketball lost to the Snow College Badgers 65-57 in Ephraim on Saturday. They began the first quarter keeping pace with the Badgers and only trailed 11-10 at the end of the period. Last time the Eagles were in Ephraim they trailed Snow 20-7 after one quarter. I thought we started out good, we got the tip, our energy was good and we got some quick stops. We didn›t get in the hole we have been getting in lately,» said USU Eastern guard Harlee Willoughby. By halftime the Eagles trailed 25-22 and didn›t allow the Badgers to go up double-digits before the break. To open the second half the Badgers went on a 10-0 run in the first four minutes that put the Eagles in a tough situation. «The team played hard but the 10-point run hurt us,» said USU Eastern Head Coach Chelsey Warburton. The next three minutes of the third quarter saw the Eagles get back into the game thanks to the bench play of sophomore Autumn Kay, freshman Morgan and Willoughby. They combined to score 11 points in that time span to help the Eagles cut the lead to only 39-37 heading into the fourth quarter. In the fourth quarter the Eagles would allow the Badgers to pull away and lead as much as 15 points. Willoughby said that turnovers played a big part in falling behind in the fourth quarters. «There was a couple turnovers right by each other and one of their non-shooters got two lucky threes to roll in that haven›t all season,» said Willoughby. The Eagles would cut the deficit down to single digits but ran out of time giving Snow its third win of the season over USU Eastern. Sophomore Madison Loftus led the Eagles with 12 points. Kay and Willoughby combined to score 14 points with 9 rebounds off the bench. USU Eastern will finish the season 17-13 and will be the fourth seed in the upcoming Region XVIII tournament. They will have to win three games in three days at the tournament to qualify for the next part of the postseason. «We will need to play solid as a team and take it one game at a time,» said Warburton. The opening round of the tournament will be Thursday in Ephraim against Colorado Northwest. Tip off time is still to be determined. Tournament information such as streaming, schedule and bracket will be released later this week.